Between March 13 and April 8, 2018, a foot survey was conducted in North CAR to assess the status and trends of large-bodied wildlife species and human activities. 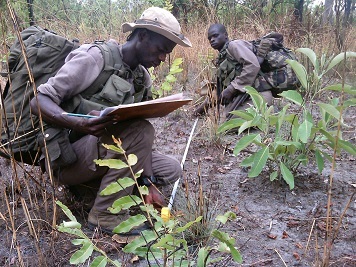 This activity is part of the Ecological Monitoring. While stressing that the confidence indices of the estimates, expressed in CV%, are high, the most common species, estimated at more than 2,000 individuals in the area of ​​7,996 km2 recorded in 2018 are: baboon (Papio cynocephalus), derby eland (Taurotragus derbianus), Grimm’s duiker (Sylvicapra grimmia), warthog (Phacochoerus porcus) , hartebeest (Alcelaphus buselaphus major), red-flanked duiker (Cephalophus rufilatus), hippotrague (Hippotragus equinus), Patas monkey (Erytrocebus patas), green monkey (Cercopithecus aethiops), guib (Tragelaphus scriptus) and orbi (Ourebia ourebi). No evidence of sitatunga (Tragelaphus spekeii), damalisque (Damaliscus lunatus korrigum), kudu (Tragelaphus strepsiceros), cheetah (Acinonyx jubatus) or ostrich (Struthio camelus) was recorded in the surveyed area.